Sleep is the golden chain that ties health and our bodies together- Thomas Dekker. When Dekker wrote the quote above, I wonder if he ever imagined what modern humans have to go through to find that golden chain. He certainly understood sleep to be something precious- as precious as gold. When it’s time to purchase a mattress there’s a lot hanging on this crucial purchase. For one, you understand that sleep is essential, you also know that sales representatives are not always trustworthy. If only when purchasing a car and a mattress and a house that those selling these items really had your best interests at heart. It would be so much less stressful to shop for these vital items. That being said, there is hope. Today, the mattress industry is so huge that the purchaser actually has a lot of the power- as it should be! Mattress companies both large and small are aware that the competition is steep and they sincerely want to earn your business. That’s the good news. Sure, you’ll still find a sleazy shop where the sales representative is working on commission, impatient and pushy, but we’re not going to talk about those. 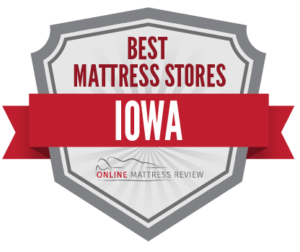 We combed through the top-ranked mattress stores in Iowa and picked out locations that offer quality mattresses, a wide variety, great customer service, and convenience. We also looked for places that honored their return policy, and provided fast delivery options. As the industry grew along with it did the places the now offer mattresses. In addition to Des Moines, Cedar Rapids, and Davenport Fort Dodge, Marshalltown, and Iowa City also offers mattresses. If you ever feel stuck, there’s also a fantastic market for mattresses online. If you are looking for a mattress store in Des Moines, Iowa rest easy. There are a number of options. In fact, sometimes there are so many you may experience choice fatigue and along with it a dose of stress. No need to toss and turn at night, we actually did everything except try the bed for you. We looked at mattress stores that provide quality products, great customer service, and convenience perks to help you get your mattress in a timely fashion. Midwest Mattress (3128 100th St.) has it all. When you enter you’re greeted by a friendly and attentive team that will work with you to ensure you find a mattress to meet your needs. Next, they throw in free delivery, free old bedding removal, a one year warranty, and $200 worth of items with you purchase. No matter what your price point, Midwest Mattress works to ensure they find something to meet your needs. Luck you, Des Moines, it’s rare to find a mattress store that does it all. There’s an additional location in Ankeny. If you are looking for a premium locally-made mattress, you could try Lebeda Mattress Factory (3180 100th St.) where you’ll find a great team of knowledgeable professionals and an “artisan crafted” quality mattress. Whether you’re looking for adjustable, latex, memory foam or otherwise, Lebeda can make it for you. If you are looking for a mattress near Des Moines, head to Bedtime Mattress in Ankeny (502 N Ankeny Blvd.). Here you are welcomed by a friendly and knowledgeable sales team whose focus is truly on customer service over sales. They are easy-going and have been working in the business for nearly 2 decades. If you are looking for a mattress store near Cedar Rapids, Iowa why not try Lebeda Mattress Factory in Coralville (312 1st Ave.)?We know it’s not directly in Cedar Rapids, but the quality and the craftsmanship were too good not to mention here. Lebeda not only offers locally-made premium beds but also a knowledgeable and patient sales team that won’t pressure you to buy something out of your comfort zone. If you are looking for a steep discount why not head to Bill’s Bros Freight Salvage Furniture Liquidators (3717 1st Ave SE) for a deal. The perks of this company are that they are located directly in Cedar Rapids, and offer affordable products from a friendly staff. For those who aren’t really sure what they want or need a change, you could head over to Denver Mattress in Marion (725 Oakbrook Dr.) where you’ll find a huge selection of mattresses and a 200% Guaranteed Lowest Price Pledge. This is a great opportunity to head into the shop, try some items and then leave and do some price shopping and return with an offer. What’s more the staff aren’t pushy and they really do work to ensure you find a quality mattress within your budget. There’s an additional location in Davenport (4601 Elmore Ave.) For a family-owned and operated mattress shop head out to Waterloo where you’ll find Fosters Mattress (3840 University Ave.). Fosters Mattress makes their policies very clear on their website and offer returns within a 30-120 window. Unlike other large box chains, there are no hidden fees. The best part is probably the level of knowledge and expertise brought to you from the owners. You’ll never be pressured to purchase and asking questions is expected here. Those who live in Waterloo are lucky to have this mattress shop on this door step, and for those who live in Cedar Rapids, it is worth the drive to meet the owners. If you are looking for a mattress store in Davenport, Iowa you’re in luck. Davenport has a number of quality mattress shops. For those looking to grab a few items for around the home and a mattress, you could head to Furnish 123 (902 W. Kimberly Rd.). This is a great place to do a one-stop shop with a huge selection of mattresses and furnishing for affordable prices. For those who need to focus just on a quality mattress, try Mattress Firm (4009 E 53rd St.). Mattress Firm carries over 55 different types of mattresses and always offers a 90 Day money back guarantee as well as convenient delivery. What sets this location apart from the others is certainly the staff. This knowledgeable sales team are more eager to ensure you find something that fits than to simply sell you a mattress. What’s more, they offer affordable prices and regularly have major sales on holidays. Lebeda Mattress Factory (321 W Kimberly Rd.) is an Iowa favorite. You can find premium locally-made mattresses to fit your specific needs. Looking for special fibers and firmness levels? Try Lebeda Mattress Factory.